Tanja Philippeit (born 1970 in Hamburg) is a game designer and publisher from Germany. In 2016 she founded Starnberger Spiele, a small publishing company that makes games for the entire family. Games that are fun, straight and simple. 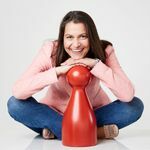 With her special touch, Tanja Philippeit creates games that are easy to learn, have an appealing design and invite you to play. Tanja Philippeit lives in Munich with her husband and two children. She works at lake Starnberg, where she grew up and ever since enjoys the beautiful landscape. She earned a PhD in psychology and also works aa a business coach and mentor for entrepreneurs.